The accurate and detailed investigation of accidents and incidents is essential to the health and well-being of all workers at a workplace. Such an investigation can help to ascertain the cause of an accident, incident or near miss and help to prevent a recurrence. Approx running time - 1 hour. NORCAT’s Accessibility for Ontarians with Disabilities Act program explains the purpose and scope of the Act, discusses the responsibilities of people and organizations under the Act, and lists recommended principles and relevant information for communicating and interacting with people with disabilities. Volume discounts available, please call. Approx running time - 45 minutes. The Asbestos Awareness course is intended for anyone who may come across asbestos in their normal line of work, or anyone who works in a facility where asbestos may be present. It is intended to increase worker knowledge regarding asbestos, and to reduce the hazard of accidental exposure. Approx running time - 30 minutes. The Chemical Hazards course will give users an understanding of basic chemical principles and terms, the hazards associated with the various broad classes of compounds, and the dangers of inappropriate storage and mixing of incompatible materials. Topics include: Sustainable Forest Management Certification; Qualified Logging Professional; Species-at Risk, Invasive Species, Forecest with Exceptional Conservation Value; Best Management Practices for: Harvest Operations, Access, Reforestation & Aesthetics, Dangerous Goods; and Legal Requirements. NORCAT&apos;s Confined Space Awareness program addresses all of the issues required to become aware of and take the appropriate precautions when working around confined spaces. Approx running time - 35 minutes. NORCAT&apos;s Confined Space Entry program addresses all of the issues required for entry into a confined space. Please note that site specific training is always required to identify the specific hazards and equipment required for every work situation. NORCAT&apos;s Excellence in Customer Service program introduces potential customer service representatives to the fundamentals of customer service, while highlighting specific methods for communicating and dealing with customers effectively. NORCAT&apos;s Fall Protection Awareness program delivers the theory of fall protection to workers who are working at heights. The General Safety Awareness (GSA) program provides work guidelines that employees should know and follow. The program highlights rules of conduct, personal protective equipment, personal hygiene, and safe work practices. Approx running time - 2 hours. NORCAT&apos;s Lift Truck Awareness training program provides the theory a lift truck operator requires prior to practical training. NORCAT&apos;s Lockout / Tagout training program is an introduction to the practices and procedures of lockout / tagout. The Ontario Occupational Health and Safety Act is designated to protect workers against health and safety hazards on the job by spelling out the rights and responsibilities of the various parties. The Ontario Occupational Health & Safety Act is designated to protect workers against health and safety hazards on the job by spelling out the rights and responsibilities of the various parties. This program was developed to give workers an understanding of these rights and responsibilities, and to explain the three basic rights afforded each worker under the OHSA. Workplace accidents are a common occurrence and almost all can be prevented. NORCAT&apos;s Office Safety Awareness course will inform you of safe work practices, teach you how to recognize potentially dangerous situations in the workplace and how to react in a responsible manner. NORCAT’s Respiratory Protection Awareness program discusses the two main types of respirators, things to look for when performing an inspection, fit-testing and fit-checks, physiological and psychological limitations of wearing a respirator, types of filters and cartridges, warning properties, and respirator cleaning, disinfection and storage. NORCAT&apos;s Safe Work Practices program will inform workers about the proper personal protective equipment required to do a job, the safety guidelines necessary for dealing with specific workplace situations and hazards and how to safely handle, maintain, and operate hand tools. NORCAT&apos;s Toxicology course will give users an understanding of what constitutes a poison, the ways these substances enter the body and the effects they have on the body, and how the toxicity of a substance is measured. NORCAT’s Traffic Control Person program outlines signs used in traffic control, directing traffic on different types of roadways and speed conditions, Communication methods during traffic, control, role of the Signaler, Personal Protective Equipment used by traffic control person, excerpts from Occupational Health and Safety Act and Ontario Regulations, and construction projects pertaining to traffic control. NORCAT&apos;s Transportation of Dangerous Goods complements the Act and fulfills the training requirements for drivers as established by Transport Canada. NORCAT&apos;s Transportation of Dangerous Goods for Shippers complements the Act and fulfills the training requirements for drivers as established by Transport Canada. WHMIS (Workplace Hazardous Materials Information System) 2015 is the national standard for hazard communication in Canada and is required by employers to educate all employees about the safe handling, storage and use of controlled products in the workplace. WHMIS 2015 incorporates aspects of the Globally Harmonized System of Classification and Labelling of Chemicals, also referred to as GHS, which was developed by the United Nations, in cooperation with all member states, as an international system of hazard communication. On February 11, 2015, the Hazardous Products Regulations (HPR), in addition to amendments made to the Hazardous Products Act (HPA), changed WHMIS 1988 to incorporate the GHS for workplace chemicals. The two hour e-learning program includes new pictograms, replacing some hazard classes and identifying new classes (including hazards to the environment). NORCAT’s Workplace Violence and Harassment program explains workplace violence and harassment as defined under the Occupational Health and Safety Act, discusses the responsibilities of supervisors and employers, and lists the worker’s rights under that Act. Approx running time - 20 minutes. Young workers are introduced to the proper techniques and practices for lifting heavy objects, painting and staining, grooming landscapes, operating power tools, using gas-powered equipment and much more. Ce programme de formation de NORCAT complète la version en langage clair de la Loi sur le transport des marchandises dangereuses et satisfait aux besoins en formation définis par Transports Canada. Ce programme de formation de NORCAT constitue une introduction aux pratiques et procédures relatives au verrouillage et à l&apos;tiquetage. Ce programme de formation en ligne de NORCAT aborde toutes les questions au chapitre de la sensibilisation aux espaces clos et de l&apos;adoption des mesures de précaution qui s&apos;imposent dans un milieu de travail comprenant des espaces clos. Au terme du programme, l&apos;apprenant ou l&apos;apprenante sera en mesure de comprendre les principes fondamentaux relatifs à la conduite d&apos;un chariot élévateur ainsi que les mesures préventives nécessaires pour conduire un chariot élévateur en toute sécurité. This program is intended to educate Contractors, Subcontractors and their employees about the City of Greater Sudbury&apos;s policies and rules regarding Environmental, Health and Safety, as well as their responsibilities and duties as outlined in the Occupational Health and Safety Act, including the Regulation for Construction Projects. Approx running time - 40 minutes. This program is intended to educate Contractors, Subcontractors and their employees about the City of Greater Sudbury&apos;s policies and rules regarding Environmental, Health and Safety, as well as their responsibilities and duties as outlined in the Occupational Health and Safety Act. The De Beers Victor Mine Orientation program will be delivered by NORCAT at their Sudbury and Timmins locations as well as online through our eLearning programs. This mandatory orientation program is for contractors and service providers reporting to the De Beers Victor Mine starting September 1, 2015. The training program will include information specific to Victor Mine as well as awareness training in lock out/tag out, confined space, fall protection and Ministry of Labour Worker Health and Safety Awareness. The program must be renewed every 12 months and proof of training will be provided on your NORCAT Qualification Training Card. Proof of training must be provided to De Beers to gain Right of Entry (ROE) access to the mine site. Approx running time - 6 hour. Detour Gold&apos;s mandatory site orientation for all contractors working at the Detour Lake Mine provides the basic information required to work safely, efficiently and environmentally friendly while at site. Please be advised that all contractors and service providers working at Detour Gold to complete this new training program prior to arriving at the Cochrane Bus Terminal or Site Gate House. 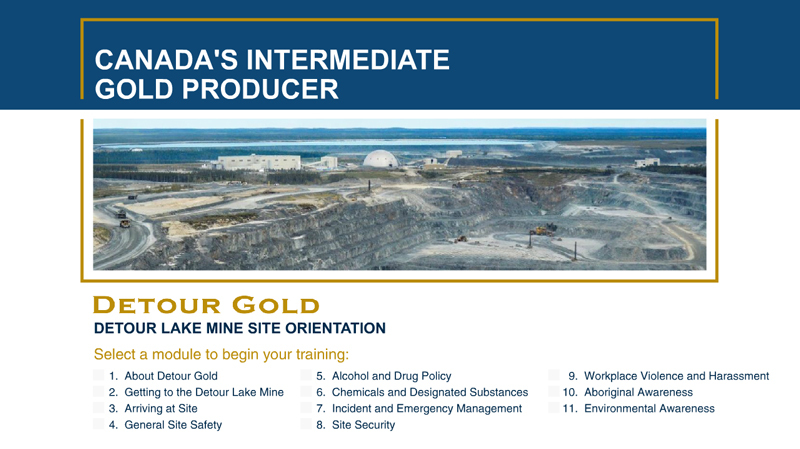 The following modules will be covered in this new program: About Detour Lake Mine, Getting to Site, Arriving at Site, General Site Safety, Alcohol and Drug Policy, Chemicals and Designated Substances, Incident and Emergency Management, Site Security, Workplace Violence and Harassment, Aboriginal Awareness and Environmental Awareness. This program is delivered in an eLearning format. The program must be renewed every 12 months. Detour Gold&apos;s mandatory Process Plant safety orientation is for all contractors and service providers working at the Detour Lake Mine Process Plant. The training program will include information specific to the Detour Gold Process Plant with respect to Process Plant Safety, Cyanide Awareness, and Lead Control & Awareness. Contractors are required to complete this program prior to arriving at the Cochrane Bus Terminal or Gate House. Program must be renewed every 12 months. The Kirkland Lake Gold Orientation - Surface Induction program is established by Kirkland Lake Gold to ensure all employees and contractors working on their property know site specific information and policies, legislative rights and obligations and how to exercise safe work practices. Contractors and service providers working on surface properties require the â€œKirkland Lake Gold Orientation - Surface Inductionâ€ program. Approx running time - 90 minutes. The Kirkland Lake Gold Orientation - Surface and Underground Induction program is established by Kirkland Lake Gold to ensure all employees and contractors working on their property know site specific information and policies, legislative rights and obligations and how to exercise safe work practices. Contractors and service providers working on underground properties require the â€œKirkland Lake Gold Orientation - Surface and Underground Inductionâ€ program. Approx running time - 2.5 hours. This program provides workers with the basic information required to work safely and efficiently. The training program will include information specific to KLPC with respect to safety procedures, company rules and policies, and site requirements. The program will be delivered in an eLearning format. The program must be renewed every 36 months. Please be advised that all new contract employees and service providers working on KLPC property are required to complete this new training program before arriving on KLPC property. Proof of training will be required to gain access to KLPC property. Safety is the paramount objective at Glencore. Glencore looks to continually improve in all aspects of safety throughout their organization. This includes their Contractors that are working at Glencore sites. With Safety as their prime focus, NORCAT is pleased to announce the launch of Sudbury INO	&apos;s new revision to their Contractor General Orientation effective July 9, 2018. This newly updated program amalgamates all three associated Sudbury Integrated Nickel Operations sites (Smelter, Nickel Rim and Strathcona/West End) along with their policies and procedures. Contractors working on site at any of these sites must successfully complete the online orientation program delivered by NORCAT. This program introduces participants driver safety awareness, rules of the road and road safety along with pertinent security and sign in offices. Along with this, drivers will also be made aware of proper personal protective equipment required for site entry, mobile equipment and potential hazards encountered on site, reporting accidents and injuries and environmental spills; etc. NORCAT&apos;s Transportation of Dangerous Goods for Shippers - Glencore complements the Act and fulfills the training requirements for drivers as established by Transport Canada. An additional module pertains to Glencoreâ€™s Waste Management System and Manifest. The Tahoe Canada Orientation was established by Tahoe Canada to ensure all employees and contractors working on their site know their legislative rights and obligations and exercise safe work process while on property. The program is an overview of all requirements to working on surface and/or underground at the facility and will familiarize everyone taking the program to the site layout and all Tahoe Canada specific health and safety policies and procedures. The duration of the course is approximately 90 minutes in duration and all contractors required to work on the property must have the course completed by August 1st, 2015 and must be renewed on a yearly basis. The program is an overview of all requirements specific to working on surface at the facility and will familiarize everyone taking the program to the site layout and all Tahoe Canada specific health and safety policies and procedures. The duration of the course is approximately 60 minutes in duration and all contractors required to work on the property must have the course completed by August 1st, 2015 and must be renewed on a yearly basis. The Tembec-specific Confined Space Awareness program addresses all issues required to become aware of and take the appropriate precautions when working around confined spaces at the Tembec site. This general Lockout & Tagout training program is specific to Tembec property in Temiscaming and an introduction to the practices and procedures of lockout & tagout. Contractors entering onto company property must successfully complete the site orientation program delivered by NORCAT. Proof of training must be carried at all times when working on company projects. To reinforce the value ?life matters most?, Vale has implemented a Contractor Site Entry Orientation, which is a graduated process to gain access to areas within a plant or site where work activity takes place. Vale?s Tier 1 Orientation Module covers content common to all plants and establishes a core certification for accessing Vale Surface properties and prepares workers for the specifics of Tier 2 and Tier 3 modules according to individual work assignments. All workers should be committed to reducing or eliminating workplace hazards and injuries. Whether it is a Vale worker, visitor or contractor, it is important that all sections of this module be reviewed and understood, so that everyone goes HomeSafe. The overall objective of this orientation is to ensure workers are knowledgeable of Operational Controls, so that everyone can conduct themselves safely and within the acceptable boundaries of controlled risk within Vale Operations: Golden Rules, HR Policies, Health Programs, Safety Procedures, Environmental Controls. The Vale Tier 1 program will be replacing the current General Orientation as a pre-requisite for VALE contractors ONLY. Note: The NORCAT General Orientation training will be ?grandfathered in? and will be recognized as compliant until the expiry date shown in your records. *all prices are subject to applicable taxes. Adobe Flash is required for demos.